It’s very common to have a large amount of data that we want to display on the iPhone/iPod, but there’s no way that we can fit all at the same time on the screen (even on the iPad), that’s one of the functionalities of the UIScrollView. The UIScrollView it’s a very versatile class, you can handle zooming, panning, scrolling, etc, and I have no intention of explaining all the properties and delegates (well, if you want to know something about the UIScrollView, fell free to request it in the comments, just let me know =D ), the documentation itself is pretty good, so you should give it a look. In this post I’ll create a very simple project with three scrollable UIViews just to get familiar with the UIScrollView, and in the next post I intend to do some simple zooming example. So, the next post will be about the UIScrollView as well. IMO, there’s 2 very important properties in UIScrollView, the contentSize and the contentOffset. The contentsize is the width and height of your content, it’s a CGSize and a property of UIScrollView, let’s say that you have an image that’s 500×500, it would not fit on the iPhone screen, right? So, set your contentsize to 500,500. If you want to add more scrollable space at the bottom or at the top, you can use the property contentInset.top and contentInset.bottom, so you can add some extra space without changing the contentsize. And why would you need these insets? Well, if you have a UINavigationBar or a UIToolBar, like the photos app, you will use this. 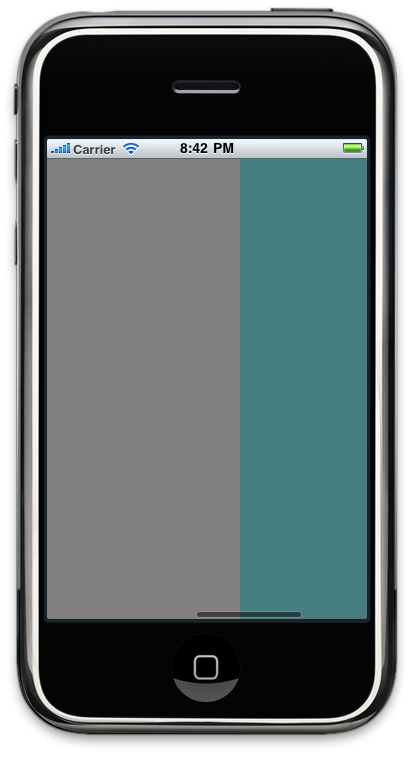 Every UIScrollView has a scroll indicator (it’s visible by default, but if you want, you can hide it with showsHorizontalScrollIndicator and showsVerticalScrollIndicator), to give an indication of how far in the content you are, and you can change where the indicator starts using the scrollIndicatorInsets.top just like the contentInsets. The contentOffset is the point that is currently visible, this point represents the top left of your screen. The contentOffset discards the contentInsets, so it can happen that the contentInset is negative, that’s not a problem. Create a View-based Application and name it SimpleScroll. Again, I always use the Window-based Application for my projects, but let’s pick the View-based just to speed things up. If the value of this property is YES, the scroll view stops on multiples of the view bounds when the user scrolls. The default value is NO. The most important part in this for is to understand the xOrigin. This will place every UIView exactly where the previous UIView has stopped, in other words, each UIView will start at the end of the previous one. The contentSize is just the sum of the widths of the three UIViews, if the width of each UIView is 320, and we have three UIViews, your contentSize width will be 920. As you can see, I changed the background color of the SimpleScrollViewController UIView to red, just to make sure that you can distinguish the content of the UIScrollView. That is the tutorial, pretty simple, huh? Now you can show all the data that you want on this small screen 😉 Next post I’ll write about how to enable zooming using a UIScrollView.